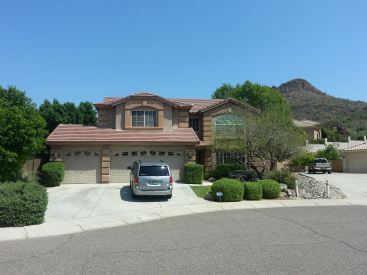 6316 W Range Mule Dr.
Come see this beautiful and spacious home in an awesome neighborhood with Mountain Views. You'll know it when you see it - this is the ONE. Very warm and inviting, this home offers a spacious kitchen with granite countertops, plenty of cabinets & a pantry. There is are updated appliances and the kitchen opens to family Room with a fireplace. Efficient & formal LR/DR. Large Master & Master bath, separate shower & garden tub, tile flooring has medallion inlay. There is a handy guest bedroom and 3/4 bath downstairs. Enjoy Mountain views & backyard while entertaining in your sparkling heated pool, spa and built in gas barbecue. Covered Flagstone patio, plenty of grass for the kids and mature shade trees. Only a few minutes to shopping and easy access to freeways.